I’m sure some parents will experience it in their life. The moment you get a bit tired of your offspring. That you would love to put them on a rocket and shoot them to the moon, so that you get a little bit of time and space. Even though your love for your children is unconditional and sincere. This moment will only last a few seconds with normal parents before they look back at their kids lovingly and realize they can’t live without them. Not here in “Mom and Dad“. Here you’ll see parents in a small American town, who suddenly turn into murderous psychopaths with only one goal. And that’s killing their lovely children. Why did it happen? Beats me. The cause of this parental hysteria is not entirely clear. Is it, like in “Cell“, an electronic pulse that triggers their behavior? Or is it a mutated virus? Don’t expect an explanation. In any case, it causes mothers to leave a little baby in the car which is parked on a railroad crossing. Or a big fat family man swinging around with a bloody baseball bat. And a bunch of fleeing students who are being tackled en masse by crazy parents. The movie isn’t exactly horifying or scary. Only the scene with the newborn baby gave me an uncomfortable feeling. That’s what you get with frustrated parents. It feels like a typical zombie movie with parents walking around with a glassy look. The only difference is that they only have an eye for their own children and don’t have the urge to chase every panicking teenager. 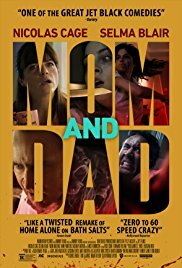 “Mom and dad” is complete madness and highly entertaining. Nicolas Cage shines as the father who thinks he’s a complete failure. His dreams didn’t come true and his career isn’t that what he had imagined. The same applies to his wife played by Selma Blair. A bitter-toned, exhausted mother who can’t accept that her daughter doesn’t show any affection anymore for her. She has been exchanged for weed smoking girlfriends and the omnipresent social media. Their frustrations become obvious during the pool table scene, where they pour their guts out. It’s been a long time ago since I’ve enjoyed total craziness which Cage can play as one of the best. In “Arsenal” he showed a crazy “Tony Clifton” type whose tirades were brilliantly played and at the same time felt exaggerated. However, the disturbing hysteria and raging frenzy he shows here, exceeds this effortlessly. In a convincing way he shows that frightening look and pure anger. It’s as if complete madness has taken over. I admit, It’s also overly exaggerated. But that makes it humorous sometimes. The grandparents’ moment was an ingenious idea and caused the story to take a different direction. Do you like a horror comedy with a slightly macabre atmosphere? Well, that means this movie is right up your alley.